What is one worth? 8122 G on the hood real nice shape been garaged,perfect deck looks hardly used really.What's a ballpark figure? The 8122 G was made for about a year (1986?) and had a single cylinder 12 hp Kohler engine. That was the smallest engine used on a rider of that vintage, and larger engine twin cylinder engines are more desirable. Value depends a lot on location. 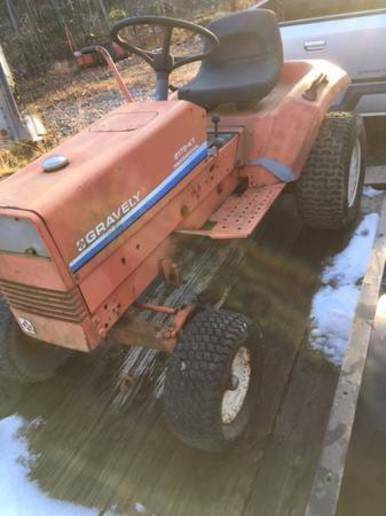 Gravely equipment seems to be more common in the eastern part of the country and seems to command higher prices. A ballpark price here in central Indiana would probably be in the $500 to $800 range but I see them advertised on Craigslist and Facebook for months on end for considerably higher prices. 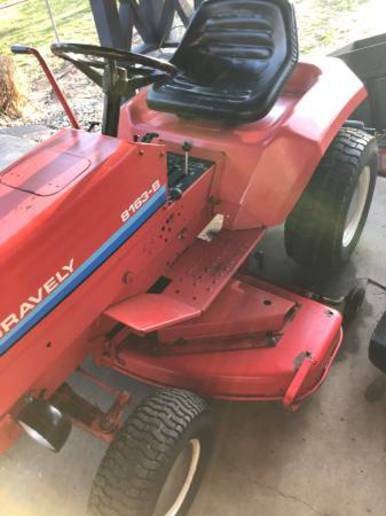 If you are new to Gravely riders, read the manuals. You can find just about anything online free. Parts are generally available, but getting rather pricey. Remember to engage the PTO clutch rapidly at low RPM and keep the linkage properly adjusted. This is because replacing the PTO clutch involves $500 or more in parts and about 8 hours labor. I think you stole it! I have saw 8122G's go for around $1000 - $2000 in good shape. The 16 and 20G Pro's can fetch upwards to around $3000 or more if they are in very good condition. I turned down a $4K offer for my 16 G. Guy came to look at the Polaris 170 RZR that my daughter is selling and he was more interested in the Gravely than the RZR. 8179KT and a 8163-B. Both are bare tractors with no attachments. $1250 + another $350 for a 60" deck.